+40,326 Whataya Want From Me 56,004,866 streams! 1,997,940 listeners / month on Spotify today (+276) A little gain today! Number of Shazams today for Feel Something 5,125 Shazams +125! Feel Something is now on 113 playlists with a total of 863,308 followers! And Pop Right Now is there again! +46,439 Whataya Want From Me 56,051,305 streams! 1,996,583 listeners / month on Spotify today (-1,357) A little drop today. Number of Shazams today for Feel Something 5,218 Shazams +93! Feel Something is now on 115 playlists with a total of 837,038 followers! Pop Right Now is still there. +49,891 Whataya Want From Me 56,101,196 streams! More streams than GT! 1,998,034 listeners / month on Spotify today (+1,451) And a gain today! Number of Shazams today for Feel Something 5,309 Shazams +91! Feel Something is now on 114 playlists with a total of 135,767 followers! Pop Right Now dropped off again. +20,646 Feel Something 1,377,940 streams! Streams going up again! +50,824 Whataya Want From Me 56,152,020 streams! Still higher than GT. I think the cover on The Voice is helping with this. 1,999,864 listeners / month on Spotify today (+1,830) Another increase! 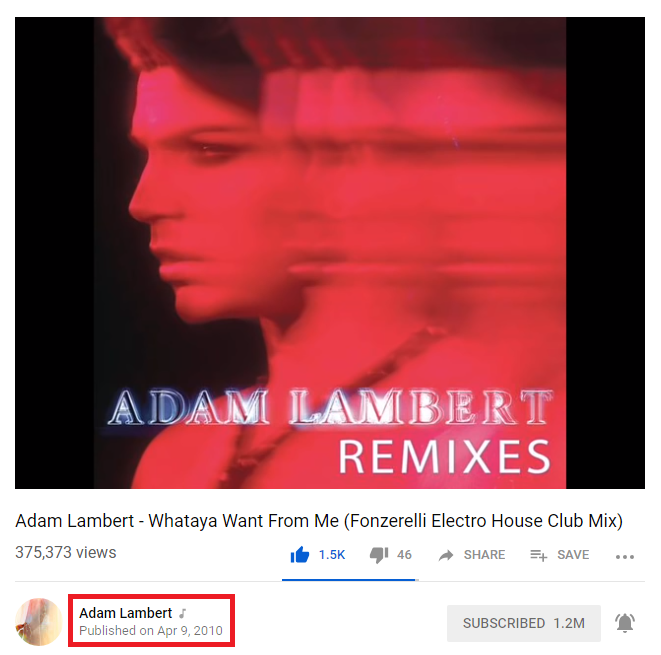 Maybe connected to the rise in streams for WWFM. 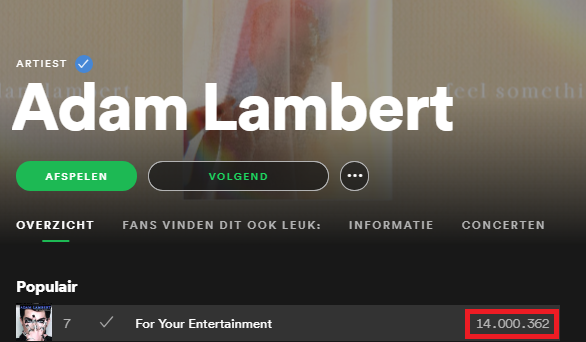 Feel Something is now on 114 playlists with a total of 880,404 followers! Pop Right Now is on the list again. +19,630 Feel Something 1,397,570 streams! +52,560 Whataya Want From Me 56,204,580 streams! Still higher than GT. I think the cover on The Voice is helping with this. 2,001,326 listeners / month on Spotify today (+1,462) Back to over 2 million again! Feel Something is now on 112 playlists with a total of 837,721 followers! Pop Right Now is still there. +18,552 Feel Something 1,416,122 streams! +52,553 Whataya Want From Me 56,257,133 streams! Feel Something is now on 112 playlists with a total of 856,195 followers! Pop Right Now is still there. +17,418 Feel Something 1,433,540 streams! +45,922 Whataya Want From Me 56,303,065 streams! Feel Something is now on 112 playlists with a total of 856,527 followers! Pop Right Now is still there. +15,795 Feel Something 1,449,335 streams! 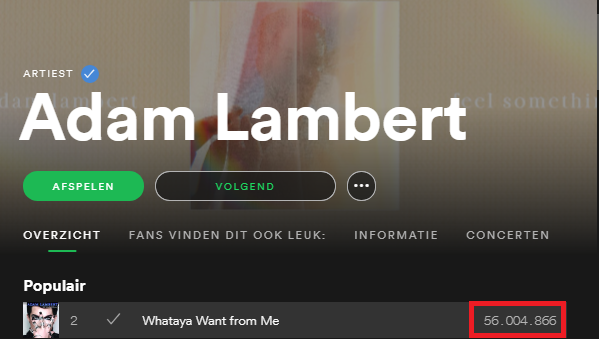 +42,775 Whataya Want From Me 56,345,840 streams! 1,996,374 listeners / month on Spotify today (-1,129) Still dropping some.